... the company quietly announced that as a result from the blowback for its recent hypocritical PR fiasco generous "wage hike" for warehouse workers which prompted a furious response from veteran employees who feared their compensation would actually decline because the company also eliminated bonuses and stock awards, Amazon would sweeten the pay for some of its longtime warehouse workers with further wage increases. As a reminder, one week ago, Amazon announced it would eliminate worker benefits, replacing larger hourly wage increases with new cash bonuses tied to employment milestones and productivity when it unveiled its plan to raise wages to $15 an hour earlier this month. But some workers quickly did the math and realized their all-in comp would decline as a result of the "pay hikes" as they would lose out on exposure to Amazon shares, which have been an extremely lucrative investment in recent years. In response, the company said it would add to its planned raises. Amazon said any workers already earning $15 would get raises of $1 per hour. Now some of those employees have learned their hourly raises will actually be $1.25 an hour, Bloomberg reported. Additionally, Amazon is (re)introducing a new cash bonus of $1,500 to $3,000 for tenure milestones at five, 10, 15 and 20 years. Slaves workers with good attendance in the month of December will also get a $100 Christmas bonus. Even so, workers still suspect they could lose money, according to an employee who asked not to be identified. The previous cash bonuses based on attendance and productivity could total more than $2,000 a year, which made a $1-an-hour raise a wash, according to another person familiar with the pay policies. The loss of stock that was awarded annually in exchange for bonuses every five years could still leave some employees with less overall money, one of the people said. Other workers were unable to calculate what these changes to their compensation packages would mean: there was general confusion among Amazon’s employees regarding the pay changes, which are still being worked out to make sure everyone’s compensation increases. Workers will get more details on the pay changes before they take effect Nov. 1, said a Bloomberg source. 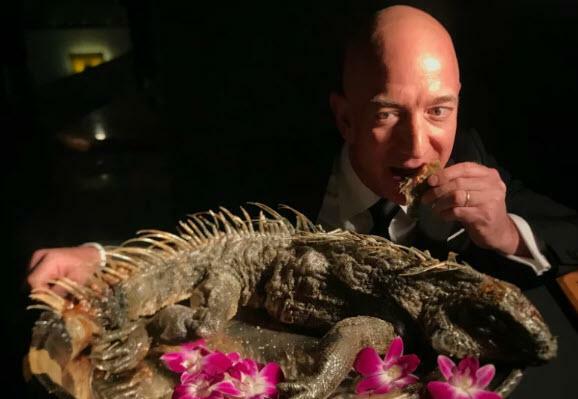 Jeff Bezos eating an iguana. Amazon said the decision to remove stock awards from compensation packages would make pay "more immediate and predictable." "Some employees have benefited from a bull market and the unusually strong appreciation of Amazon’s stock price in recent years. This is a good outcome for those employees, but such stock price appreciation is by no means guaranteed to continue," the Seattle-based company said. "For employees who want to invest in stock for the possibility of future growth, we will be rolling out a direct stock purchase plan in 2019. We are continuing to roll out the details of all these changes to employees this week." Amazon's promises to make things right aside, workers are probably right to complain about the lost stock grants. After all, Amazon shares have dramatically outperformed the market, rising six-fold over the past five years. Even if higher wages do provide more of a benefit in the short term, over time, the cancellation of stock awards will likely contribute to worsening economic inequality as fewer middle- and working-class individuals own stocks.